Byrd Williams IV at 24 (left) and his father, Byrd III, at 59. Both pursued careers as photographers. Byrd M. Williams IV's new book turns four generations into collaborators on a unique history of Texas. When Byrd Williams moved from Tennessee to Texas, in 1880, he opened a dry goods and hardware store on the Gainesville town square. In addition to his other wares, he stocked a line of cameras. Photography was just about to hit the American mainstream thanks to the introduction of easy-to-develop film by the Kodak company. Williams sold some of the first consumer-grade cameras in Texas. Then the photo bug bit the owner. 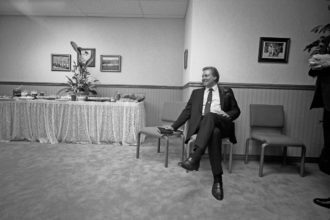 (left) In the 1980s, Byrd IV produced a photo series about evangelical Christianity. Here he captures televangelist Jimmy Swaggart after a sermon. 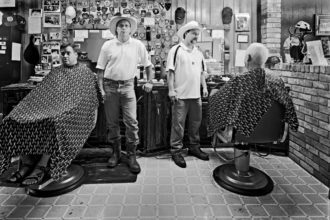 (right) Byrd IV photographed two Plano barbers and their customers in 1995. Byrd M. Williams IV’s new book, Proof: Photographs From Four Generations of a Texas Family, published by the University of North Texas Press, tells the story of what happened next. Williams’ son, grandson, and great-grandson would all take up photography, the latter two professionally, producing tens of thousands of prints and a third of a million negatives that were donated to the UNT archives in 2014. Byrd IV, 66, teaches photography at Collin College, and his work is in the collections of the Amon Carter Museum of American Art and the Museum of Fine Arts, Houston. He turns four generations of photographers into collaborators in one larger conceptual art project that includes work from three centuries and spans multiple lifetimes. In this personal and intimate view of Texas’ past, the usual tropes of cattle, cowboys, and sprawling vistas are substituted with family portraits, street photography, and travel pics. We get triptychs of relatives passing from childhood to their deathbeds, scratched-up photos that suggest intriguing and unsolvable family mysteries, and meditations on violence, religion, time, and place. The result is elegiac and life-affirming, a unique photographic history that explores the tension between the way photographs capture moments and make them permanent, and the speed with which life passes and disappears when viewed through a stack of old images. (left) Byrd I turned his photos into postcards, which he sold at his dry goods store. 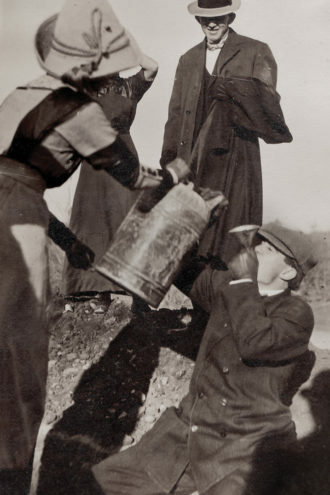 In this one, Texans guzzle liquor during Prohibition. (right) Byrd III captured two teenagers dancing in their bedroom in Mesquite in 1958.